How to start a successful side hustle. How to set goals?and build a budget that will help you reach them. How to pay off debt faster?and pay less in interest. How to cut your expenses without feeling the pinch. How to build a low-maintenance portfolio that will help you build wealth. How to save more money (101 ways!). No prior knowledge or tools required. Just an interest in helping your hard-earned money grow! For the exercises, you will want to have some of your financial info handy?like your take-home pay, how much debt you owe (student loans, credit cards, etc.) and how much you have in your savings, checking and investment accounts. If you’re ready to get your finances in shape, but aren’t sure where to start, this is it! ?In under an hour, find out how to save, invest and earn more money, stop living paycheck to paycheck and make real progress toward the future you want. Led by Jennifer Barrett, Chief Education Officer at Acorns, this basic course breaks down the what, when, how and why of personal finance to help you start building wealth?no matter how much money or financial knowledge you’ve got to start. 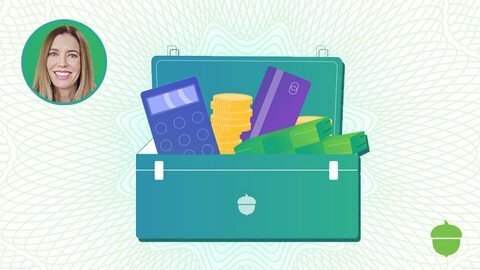 You?ll learn the basics of personal finance and get simple, on-the-go techniques and tools to help your money work as hard as you do.? What?s the difference between this and other personal finance courses? We?re focused on methods that are easy and sustainable?not disruptive to your everyday life. By the end of this course, you will have a clear sense of where you are financially, where you want to be?and how you?re going to get there. You?ll feel less stressed about money, and more confident about reaching your goals. Apply what you?ve learned and you should see a noticeable difference not just in your finances, but in your life. Anyone who wants to learn the basics of personal finance, pay off debt faster and start building wealth.